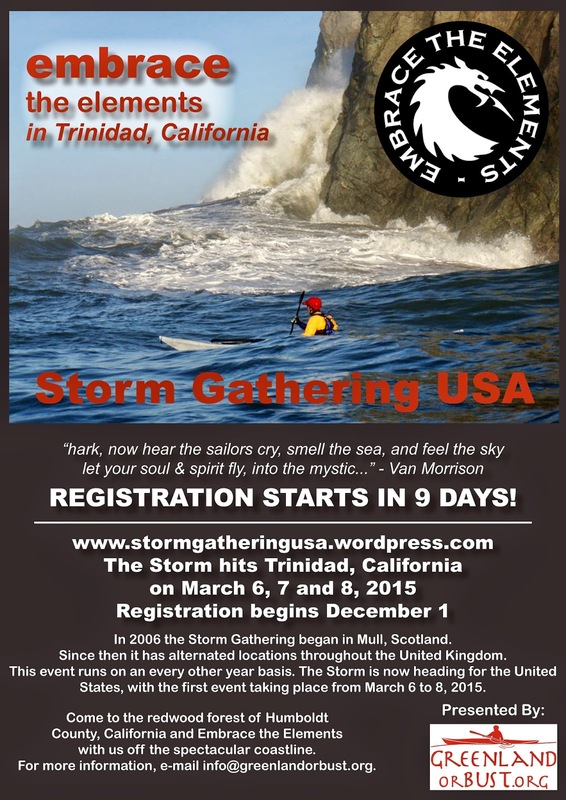 Meet the Storm Gathering USA team that will be coaching in March. Registration opens on December 1. We look forward to seeing you in Trinidad, CA. Here at Greenland or Bust, November is often one of the busiest months of the year. Although we're home, and it may appear that we're not actually working, we're really busy making plans for the coming year, and there are LOTS of exciting things on the schedule. First off we're super stoked to be attempting a first time circumnavigation of Jamaica with Wes Moses. 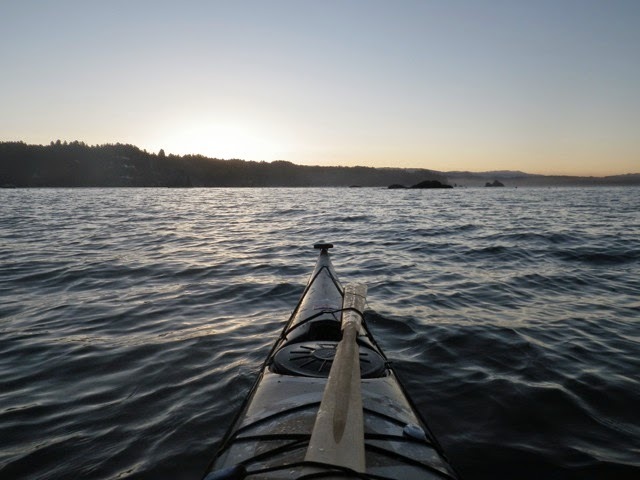 The three of us will launch on Sunday, Dec. 28 and paddle through most of January. We're looking forward to lots of water time, as well as just enjoying Jamaica. 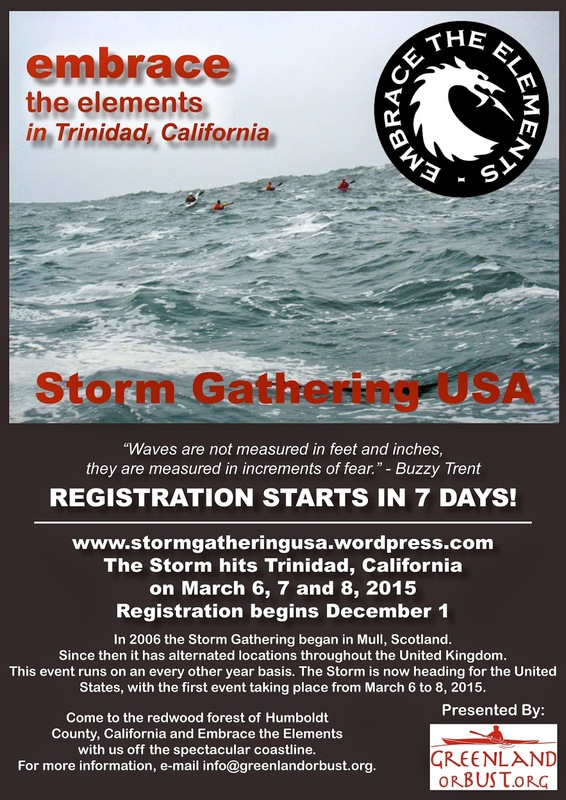 Another exciting thing on the schedule is the Storm Gathering U.S.A. event taking place out of Trinidad, California on March 6 to 8. 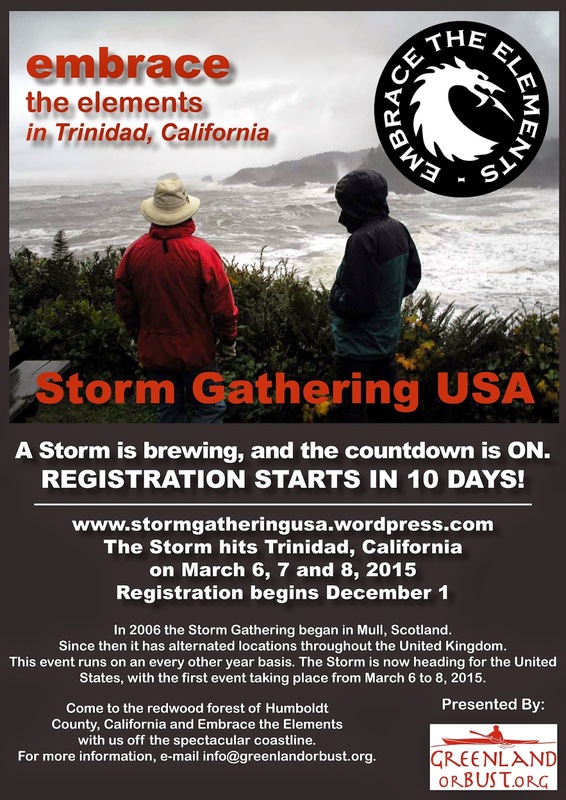 We're the organizers of the UK Storm Gathering, which has become increasingly popular since it began in Scotland in 2006. 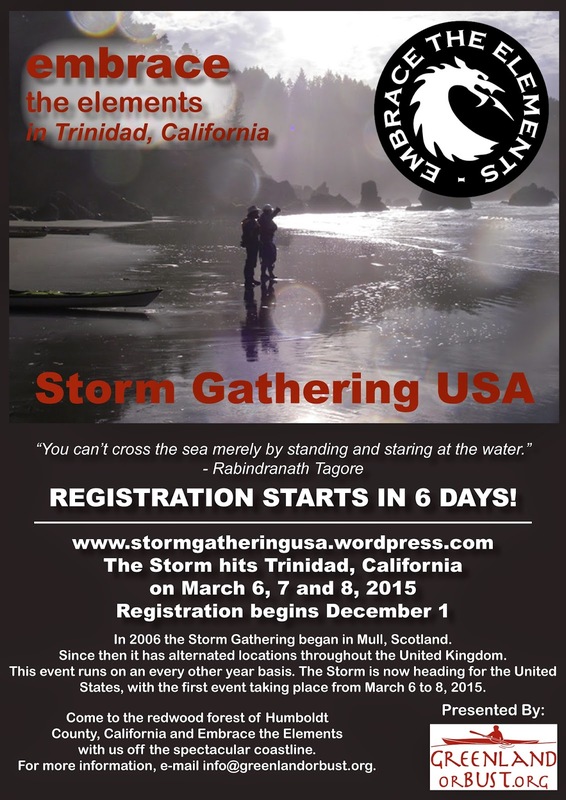 The UK Storm Gathering takes place every other year, and so we figured, "what the heck, let's run an event in the U.S. the years in between." We'll have more information posted soon, but we can tell you that registration opens on Monday, Dec. 1. Come join us, there's a storm brewing. In other works, we'll be doing another Rebel Kayaks sponsored Nordic Tour. We currently have classes confirmed in Sweden, Denmark and Norway. The tour will take place during the summer months, with a break in the middle to travel to Sisimiut, Greenland to participate in the 30 year anniversary of the Greenland National Kayaking Championship. The complete tour schedule will be posted in early 2015. We're also guiding an expedition in Antarctica from December 31, 2015 to January 27/28, 2016. Wanna go with us? E-mail us at info@greenlandorbust.org for details. With all of this exciting stuff coming up, it's nice to take a step back to reflect on the past month. Helen headed up to Pacific City, Oregon to teach at Lumpy Waters. This is a really great event, and Paul, Suzi and Dave do a wonderful job of putting it all together. If you haven't made it to this one yet, it should be on your list for next year. Helen also hopped over to Israel to teach at Optimist's Symposium. This was her fifth year at the event, and it was great to catch up with the paddling community from that part of the world. Israel is an incredible place with friendly people, warm water, unbelievable city ruins and quite possibly Helen's favorite food on the planet. While Helen was doing all of this, Mark was running a BCU 4 Star Sea Training and BCU 4 Star Sea Assessment on Anglesey in Wales, as well as providing some regional coach development programs for Canoe Wales. He was also one of the guest coaches at the DGI's Autumn Coach Conference in Holbæk, Denmark. Coming up in November Helen will be presenting in Eureka, California on South Greenland Expedition and The Greenland National Kayaking Championship. Other than that we're spending the month working on putting together all of the exciting things that are planned for the coming year. In December we'll be leading a trip out of Crescent City, California, then heading south to run classes in Dana Point and Marina Del Rey. We're looking forward to spending part of the holidays with family and then flying over to Jamaica to meet up with Wes and paddle around the place. With so much going on, it's hard not to get excited. 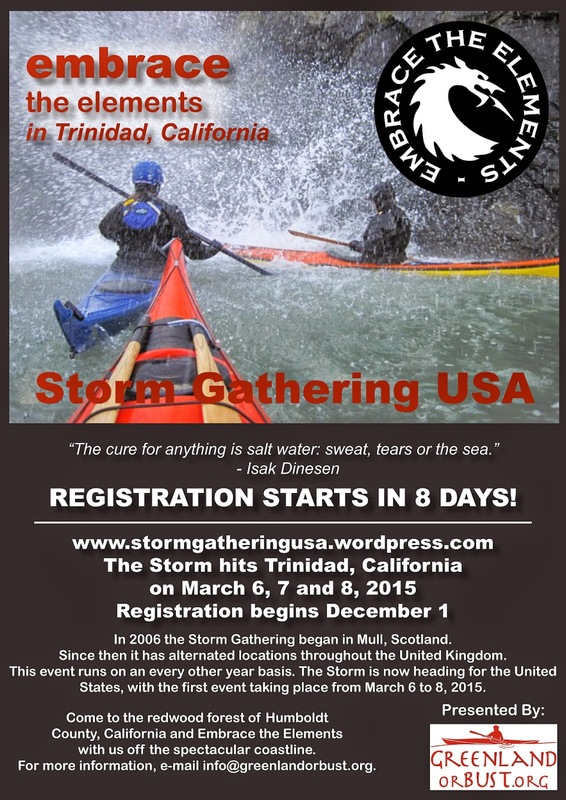 Don't forget to put our Storm Gathering USA event on your calendar! 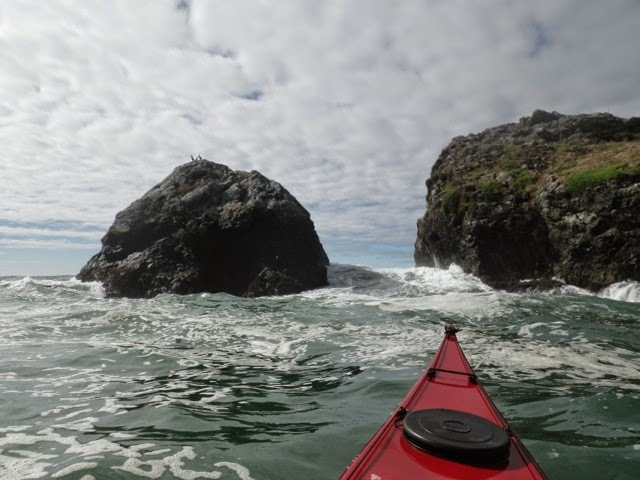 Most kayakers live close to one or more bodies of water, and many of us get into the routine of paddling out of the same spot, time after time. Depending on weather and water conditions, that same spot might change personalities frequently, which is why we don't get bored with paddling the same paddle over and over again. However, don't let yourself miss out on other great opportunities. Often where there's water, there are numerous launch sites, or even numerous bodies of water. While an ocean can provide an open water experience, a lagoon can be a secret haven, a bay on a windy day might provide a downwind adrenaline rush and a river might provide wildlife encounters that you wouldn't have in saltier waters. Whatever the body of water, there are adventures out there, and if you can't find them locally, then a road trip with friends might calling to you.